View our full range of adjustable piano stools from Just Piano Stools. For the widest choice of quality adjustable piano stool, made to order in the colour and fabric of your choice. Delivery is normally between two to three weeks for a Woodhouse stool. 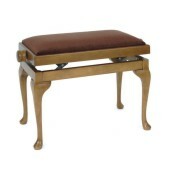 For a Tozer adjustable piano stool please allow six weeks for delivery. For more details and to see the options available just click on the image or model number. MS301 Woodhouse MS301 adjustable round piano stool. MS601 An adjustable solo piano stool, wood surround to the seat and tapered legs. MS601r An adjustable solo piano stool, wood surround to the seat and regency legs. MS601c An adjustable solo piano stool, wood surround to the seat and cabriole legs. 5018 Tozer adjustable music stool available in vinyl, dralon or leather. MS601b An adjustable solo piano stool with music storage, wood surround to the seat and tapered legs. MS601br A solo adjustable piano stool with music storage, wood surround to the seat and regency legs. MS601bc An adjustable solo piano stool with music storage, wood surround to the seat and cabriole legs. MS701 A solo adjustable piano stool with a deep padded, buttoned seat and tapered legs. MS701r An adjustable solo piano stool, deep padded, buttoned seat and regency legs. MS701c A solo adjustable piano stool with a deep padded, buttoned seat and cabriole legs. 5030 Tozer solo adjustable piano stool in a choice of vinyl, dralon or leather. MS201 An adjustable concert piano stool with deep buttoned leather seat and empire legs. 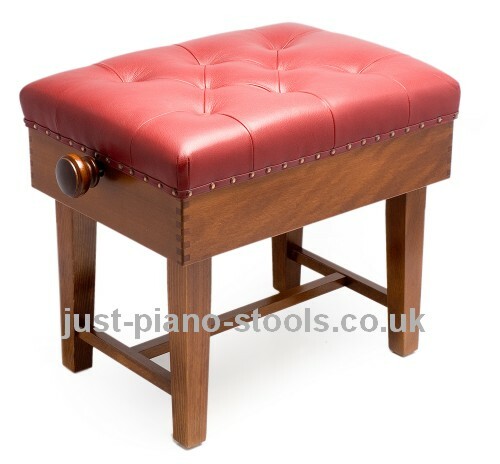 5028b Tozer adjustable concert piano stool with deep buttoned leather seat and braced legs. MS702 An adjustable duet piano stool with tapered legs. MS702 A duet adjustable piano stool with tapered legs. MS702r An adjustable duet piano stool with regency legs. 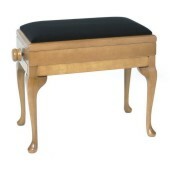 MS702ch A duet adjustable piano stool with chippendale legs. MS602 An adjustable duet piano stool with tapered legs. MS602r A duet adjustable piano stool with regency legs. MS602ch An adjustable duet piano stool with chippendale legs. MS602b A duet adjustable height piano stool with music storage and tapered legs. MS602br An adjustable height duet piano stool with music storage and regency legs. MS602bch An adjustable duet piano stool with music storage and chippendale legs. 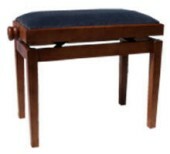 5028bd Tozer adjustable duet concert piano stool features a deep buttoned leather seat. MS603 A double seat piano stool with tapered legs. MS603r An adjustable double seat piano stool with regency legs. MS603ch A double seat adjustable piano stool with chippendale legs. 5018d Tozer adjustable double piano stool available in vinyl, dralon or leather. For the widest choice of piano stool styles, finishes and fabric colours. All available to order online. These adjustable piano stools are manufactured by Woodhouse and Tozer and are made to order. 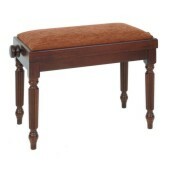 This normally takes approximately two to three weeks for a Woodhouse piano stool. For Tozer piano stools please allow six weeks. 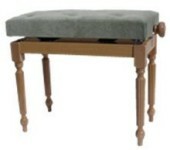 View our range of piano stool by brand. See the full range of Tozer piano stools. Available with a choice of styles and colours. Woodhouse offer a huge range of piano stools, all in selection of wood and fabric options. Below you can select the type of piano stool you require. View our selection of fixed height solo piano stools. Available with a choice of styles and colours. Our adjustable solo pianos stools offer greater flexability and have a wide selection of options. 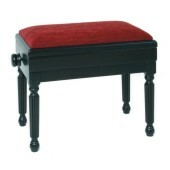 See our range of fixed height duet piano stools, all hand finished in the colour and finish of your choice. View the adjustable duet piano stools available with a choice of leg, fabric and wood colour. These classic style piano stools will compliment any traditional piano. These traditional styled piano stools will grace any modern or digital piano. These concert piano stools will bring style to any piano with their deep buttoned leather seat and Empire legs. Double seat or teachers piano stools provide greater flexability for better piano lessons. 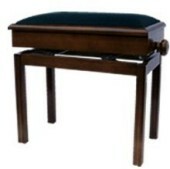 Deep box piano stools provide extra music storage for all of those important music scores and tuition books. Keyboard stools with adjustable folding metal legs. Organ height stools with music storage and straight legs. View the adjustable round piano stools available with a fabric and wood colour. Piano stools with storage, chose from solo or duet, fixed height or adjustable. Copyright just-piano-stools.co.uk. All rights reserved.